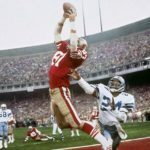 Dwight Clark, the legendary receiver on the San Francisco 49ers and responsible for one of the most iconic plays in NFL history, passed away on June 4th at the age of 61 after suffering from ALS (also known as Lou Gehrig’s Disease). In the NFC Championship game against the Dallas Cowboys in 1982, he caught a pass from 49ers Joe Montana (immortalized as “The Catch”), driving the team to win their first Super Bowl Championship. Clark was beloved by friends and teammates alike. Clark was very close with coach Eddie DeBartolo who said, “I cannot put into words how special Dwight was to me and to everyone his life touched. He was an amazing husband, father, grandfather, brother and a great friend and teammate. He showed tremendous courage and dignity in his battle with ALS and we hope there will soon be a cure for this horrendous disease.” Rest in peace Dwight Clark. The Washington Capitals handily won game 4 against the Vegas Golden Knights and now have a 3-1 lead in the Stanley Cup Finals. According to NHL stats, any team that has been up 3-1 in the series has won the Stanley Cup 31 straight times. Capitals 6, Knights 2. Game 5 on Thursday 8:00 pm ET.